Fahey Machinery Company, Inc. is pleased to introduce Dylan Hardy as the newest member of our team. Dylan, a native Californian moved to Oregon in 2011 and began his career in the metal fabrication industry as a Laser Operator. Dylan is the son of Dion Hardy, General Manager of Connor Manufacturing who was the influence for Dylan in the world of lasers as well as his greatest role model. 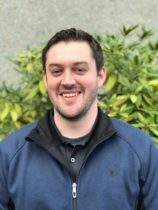 As the first Fahey Machinery Company Laser Applications Technician, he will continue to develop his skills with a visit to Mazak this fall attending a course typically reserved for training factory Laser Service Engineers. This course will be added to the many other Mazak courses Dylan has already attended in his career. This position is a new direction for both Mazak Optonics and Fahey Machinery. Viewed as a “first responder” yet still a dealer employed service technician available to help train and assist operators on both current and newer machines. This new service, which we believe will improve service request time by allowing us help the client in providing a level of triage in determining if there is an actual need to escalate the request for a Mazak service engineer or if he is able to solve the issue at hand via site visit or over the phone. The end result is an increased level of client service and more up time. Having a solid background in production with Co2 and Fiber lasers including Mazak Smart System and Radan software, will allow Dylan to have productive conversations with owners and operators of Mazak Laser cutting systems. Dylan’s favorite quote is “10% of Life is what happens to you, and 90% of life is how you react to it.” We believe he is reacting quite well.